Барааны дугаар 9780199533008. Categories: Dictionaries, OXFORD. 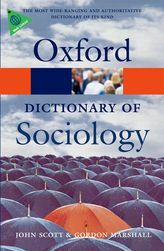 Wide-ranging and authoritative, this bestselling sociology dictionary is the most informative of its kind. Compiled by a team of sociological experts, under the editorship of Gordon Marshall and John Scott, it is packed with over 2,500 entries. With terms taken from sociology and the related fields of psychology, economics, anthropology, philosophy, and political science, it provides widespread coverage of all aspects of sociology, fromadaptation to zero tolerance. It also contains biographies covering key figures, such as Gilles Deleuze and Erich Fromm. Jargon-free entries are elaborated with clear descriptions and in-depth analysis, many using real-life examples, making even the most complicated subjects easy to understand.